Do you have a mess of a home and have been wondering how to start decluttering? Let these stress-free steps guide your process! Tired of the clutter you see as you look around your home? When you finally get to the point that know you need to start clean your home and you’re finally ready to seriously get into a routine and take control of your home, where do you start? A good starting place is to narrow down what needs cleaned in each room. You can even pray about it. Then it’s time to get down to work. 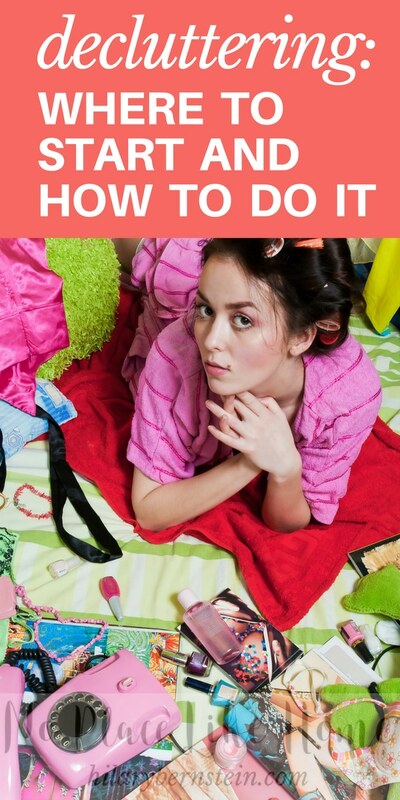 What should you do first … deep cleaning or decluttering? I believe it’s important to start decluttering in your rooms before you can start any deep cleaning. Why or how should I dust my dining room side table if it’s covered in papers or clutter? It’s foolish to deep clean the tabletop, only to cover it back up with a pile of clutter. Even if you want to get deep cleaning and even if your home truly could use a good deep cleaning, it makes much more sense to stop and do what needs to be done first. Take care of that clutter. So … decluttering. How do you get started? I suggest choosing a very small place – maybe a single drawer, cabinet, or shelf. Once you’ve picked your spot, then get absolutely everything out that space and sort it. See all the things you absolutely love and need? Everything else? Get ready to make some decisions. Selling it – you could do this online (Facebook buy/sell/trade pages, craigslist, eBay or ThredUP), at a garage sale, or at a consignment shop. If you’re on the fence about an item, box it up and remove it from the area. Then wait a month or two. If you discover that you really do need something that’s set aside, then you can keep it. But if you realize that you don’t miss it at all, then get it out of your house by donating or selling it. Once you know what you need and want to keep, put it away – either by arranging it in the same place, or putting everything in the proper place. How to Start Decluttering from Hilary Bernstein on Vimeo. After you finish putting things away, enjoy your newly organized and cleaned space! It will be tempting to hold on to everything for the sake of convenience, but don’t. The longer it ends up cluttering your life, the more tempting it will be to keep it and find a new spot for it in your home. Since one of the main points of decluttering is to purge your stuff, follow through with it. Remember that it’s just stuff – and the more stuff you have, the trickier and burdensome it is to care for your home. Now that you’ve conquered one space, move on to the next space. And keep going! Depending on how much time you have to devote to decluttering and how much clutter you have, this could be a long process. Even if it seems like it could be never ending, keep pressing on. Keep decluttering bit by bit, room by room, and you’ll soon everything will be decluttered and you’ll be ready to move on to your deep cleaning. 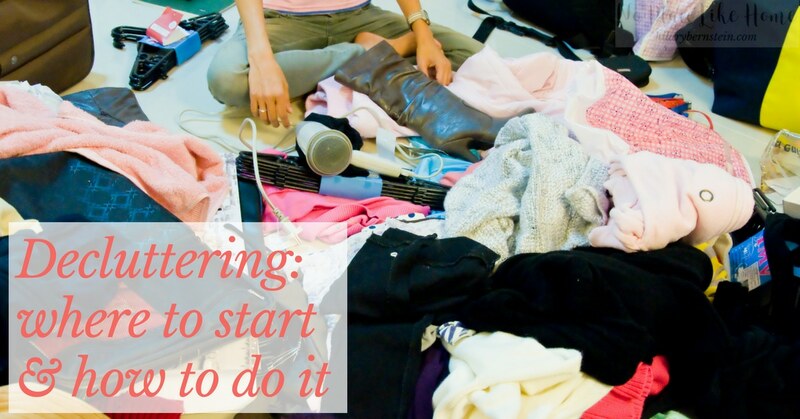 When you think about how to start decluttering, what’s your typical process? i think you’re right when you wrote to decide what to keep. if the focus is on keeping the things that are most useful and loved then getting rid of all the excess is less emotional straining. i sometimes do what you do, but i also love using Dana’s method from http://www.aslobcomesclean.com where she takes one thing and brings it right to where it goes instead of doing the piles. but it depends on how much time i have and how many distractions i expect. getting distracted in the pile making usually ends in a bigger mess…. sometimes i do the declutter by category thing ( pull out all books or all clothes or toys). but it really depends what i am up too. i try to train myself to do the one touch rule. like when i get a bill in the mail, i open it, pay it right then, scan it into evernote and throw it out. instead of setting it aside for later…. same with craft projects, i try to make proper cleanup part of the process, like doing the dishes is part of the meal. but in the moment it’s so hard to not just shove it aside! I love your one-touch rule, Lydia. I *try* that … especially when it comes to sorting mail or e-mails, but it can be so hard to be disciplined! I still like the idea of it. And I agree with you that it’s important to make clean-up part of the process, even if it’s hard to always do it.